In recent years, kale has become rather trendy, which is quite impressive for a leaf crop that has traditionally been associated with poverty, paucity and lack. It was a popular vegetable for those without much money, and definitely a vegetable for the masses (even for the cattle and other livestock). It’s also at its most prolific in the hard winter months (January – March), when conventionally there was little else growing or available for harvest, and stores were often depleted. By way of contrast, its current – and much more fashionable – reputation is directly linked with abundance. Kale grows relatively reliably as an organic crop, and has an impressive vitamin content, as well as a high nutrient density. It’s also possible that kale has a number of other health-related benefits, including as an anti-oxidant and anti-inflammatory. Together, these nutritional benefits mean that it’s an excellent vegetable to include regularly (along with a range of others) in your diet. Kale does have a relatively strong flavour which isn’t to everyone’s taste, but like many cabbage greens, it’s also extremely versatile, and it’s often worthwhile experimenting with different methods of cooking in order to determine a favourite. It can also be included raw – or lightly blanched – in salads. This recipe is extremely simple (both quick and easy) and makes for a great weekday meal. 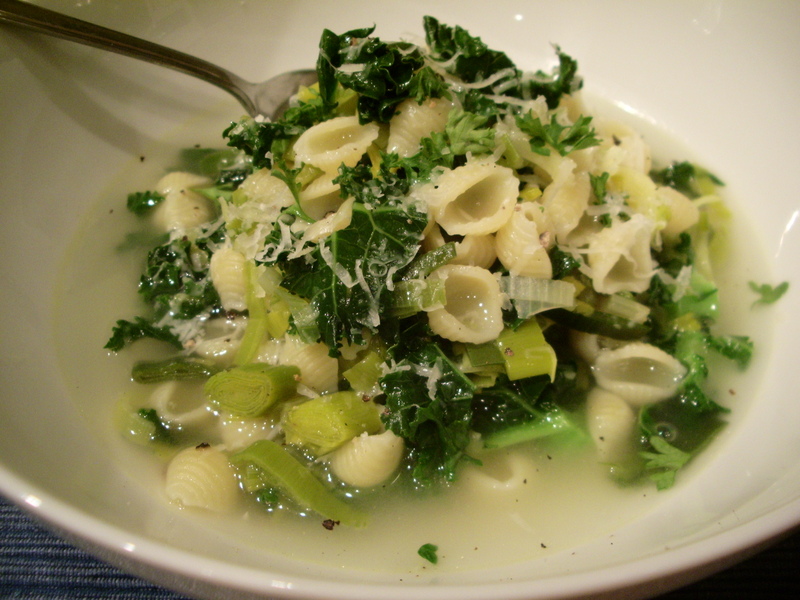 The trick – I think – is to add the kale right at the end of the soup-making process, so that it’s tender, but continues to hold on to some of its texture. I used curly kale (called green kale in the US), which also turns a beautiful, vivid, vibrant colour that looks just wonderful, especially contrasted with the various hues of the leeks. So, if you’re preparing the soup in advance make sure to add the kale only when you’re re-heating it, and not at an earlier stage. Heat the oil and butter over a medium heat and gently fry the celery for 5 minutes, until softened. 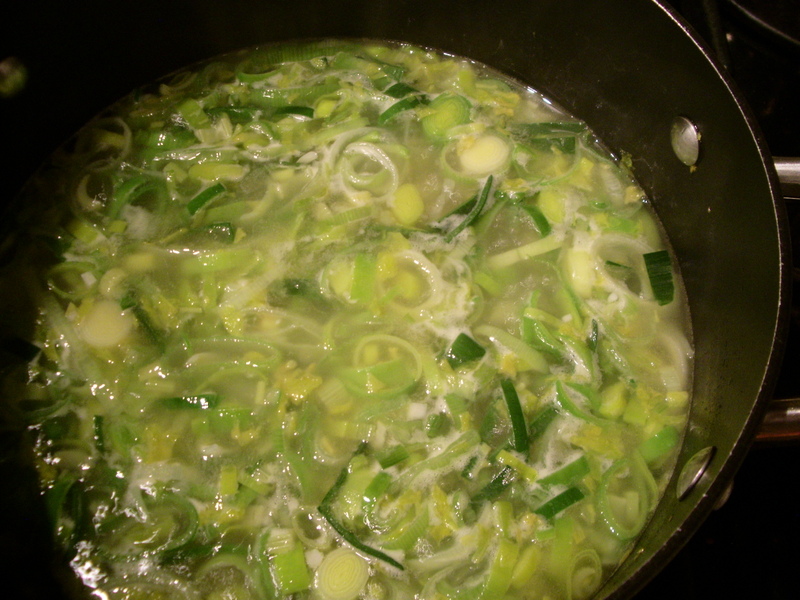 Add the leeks and continue to soften for a further 5 minutes. Stir in the garlic, cook for 1 more minute, then pour in the stock and bring to the boil. Add the pasta and continue to simmer for 6 minutes before adding the kale and cooking for 2 more minutes until the pasta is cooked and the kale is tender (and still bright green). Add some salt (if necessary) and pepper, and serve with the grated parmesan. This entry was posted in Food, Nutrition, Recipes, Soup and tagged curly kale, kale, leek, Leeks, pasta, small pasta shapes. Bookmark the permalink. Yumm! I am always looking for new kale recipes! You can never have too many kale recipes! If you try it, then I hope you enjoy it as much as I do. I have only just discovered kale. My first foray involved oven baked kale chips. This soup looks gorgeous. I love leek soup so I’m sure I’ll love this. Thanks! Leeks are my favourite vegetable, and they go so well with kale here. I’ve never made kale chips, although I don’t know why, because I’m sure that I’d love them. I’ll add them to my ‘to do’ list! Wow! That sounds amazing. 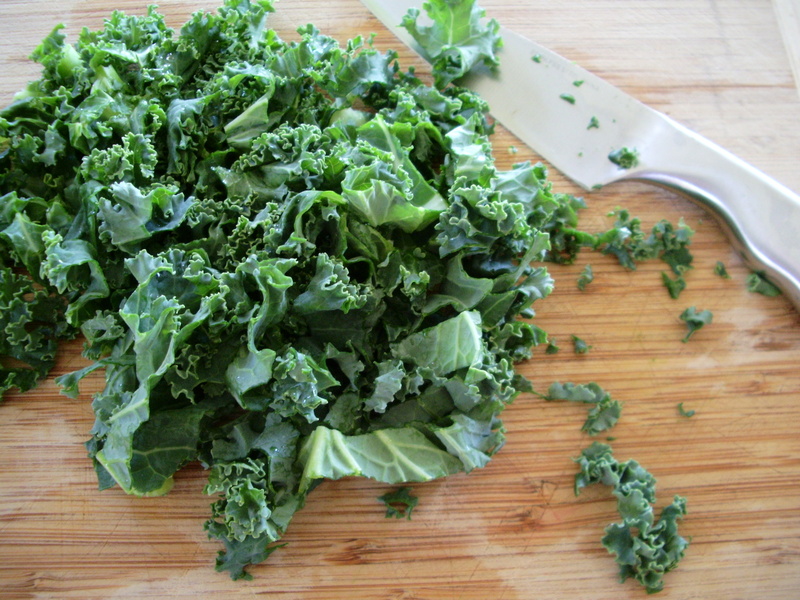 I still haven’t tried making ‘plain’ kale chips, but plan to do so soon. Sounds lovely. Really – anti inflammatory. Gotta try that.! Hi Sue. Kale is a great addition to your diet, and is fun to try in lots of different dishes – so you should definitely give it a go! Looks so light any yet I’ll bet packed with flavour! Just how I like soups – very rustic – lovely! 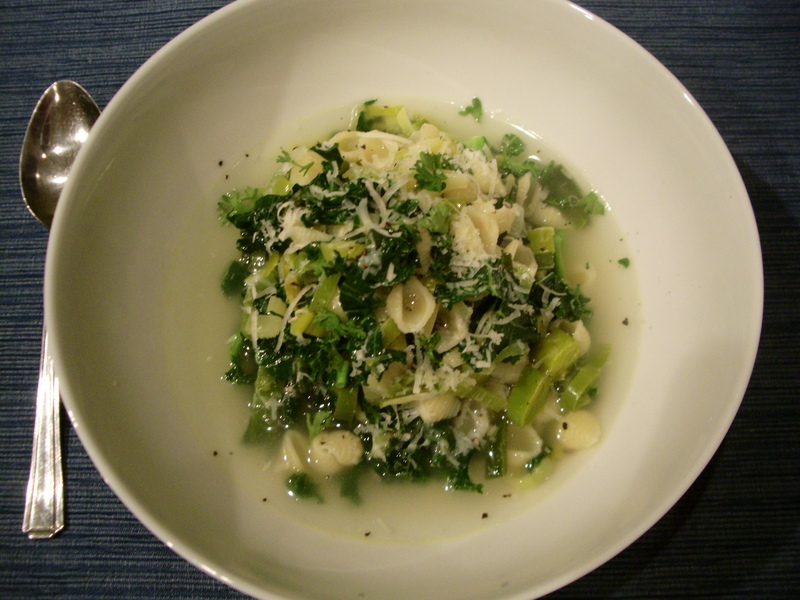 Thanks Phil – the leeks and kale make a good combination here, and the soup really does have a robust flavour. Very pretty! I like the addition of parmesan at the end. Thank you! The added parmesan – and some extra freshly ground pepper – finishes the soup off well. This looks deliciously light and healthy! Thanks! It is – and tasty too!! 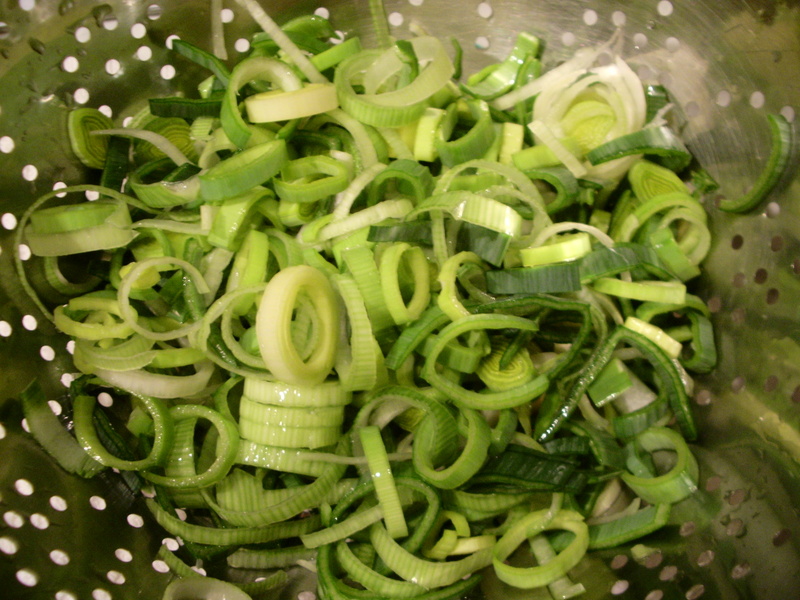 PS – Leeks have become a real favorite in our house. The combination looks wonderful! I agree – it’s great just how versatile so many vegetables are, and with so many ways to cook something like kale I’m sure that most people would find something that they really love. I eat it in all sorts of ways, and will include some more recipes soon. I really like your idea of using buckwheat instead of pasta too, and think that I’ll try that next time. Thanks for the suggestion! (I’ve said this elsewhere, but leeks really are my favourite vegetable and it’s always good to know that there are other fans out there!!). Thanks! I really enjoyed it too. this looks awesome! I’m always looking for more kale recipes to try! Thanks! It’s a great soup – and really very easy to prepare. Mmmm. That sounds lovely too.